Upgrading the Workshop of the World: Can Automation Spur Economic Development in China? In Dongguan, the ‘Replacing Humans with Robots’ initiative is an example of how China hopes to upgrade industrial performance via automation. China’s hope is to move its manufacturing sector up the global value chain. Results have been mixed, with some firms improving profits and productivity but leaving workers feeling disposable and in need of high-tech skills training, despite enjoying safer working environments. To succeed, China must hurry to address the growing skilled labor gap while also expanding the domestic market for Chinese brands and encouraging branding and design – practices which add significant product value. China’s extraordinary rate of economic growth has slowed in recent years, and Chinese manufacturers have felt pressure from declining international orders as well as rising wages (reflecting a rising labor shortage). Unfortunately, small and medium-sized enterprises (SMEs) in China have for decades followed a labor-intensive, low-value- added business model in original equipment manufacturing (OEM), a sector notorious for discouraging the development of a skilled labor force. Now, the government wants to address such problems with policies like ‘Made in China 2025’, designed in part to address the widening skills-gap. Meanwhile, the government is supporting a robotic revolution to help manufacturers increase productivity and move up the global value chain. This process of industrial upgrading looks to move workers off dangerous and dirty factory floors by replacing them with industrial robots and other automated equipment, such as computerized numerical control (CNC) machines. In the end, moving up the value chain not only means manufacturing more finished goods, but also contributing to product design, marketing and branding—important in a business environment where global brands ultimately control the sales and marketing of end products. The dynamics of these processes pose several questions for researchers and policymakers: Will automation help manufacturers in the Global South move up the value chain? Will automation improve the lot of workers suffering low wages and low-skilled drudgery under the new international division of labor? How have workers already affected by automation fared? If skilled labor falls short by 20% over the next 3 years, as projected by a 2013 McKinsey report, how will China address the shortage of skilled workers? The new international division of labor reflects the decades-long trend in which industrialized Western economies have dominated the top of the global value chain, all while shifting manufacturing operations to the Global South. Some have argued that this process will eventually reduce global inequality through technology spillovers into developing and newly emerging economies, but others have countered that the process has provided limited benefits while actually intensifying global inequality in technology and labor. 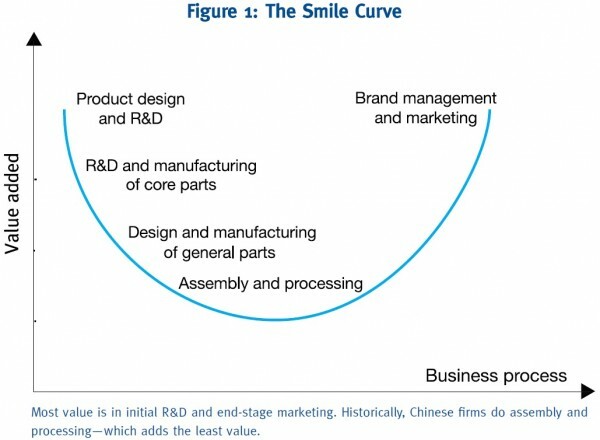 The greatest value in global manufacturing is generated through original design and manufacturing (ODM) and own-brand manufacturing (OBM), a phenomenon perhaps best illustrated by what is known as the ‘smile curve’ (Figure 1). Although some Chinese firms are successfully moving up the value chain, many Chinese manufacturers remain near the bottom of the curve, focusing primarily on assembly and processing activities. Hosting more than 80,000 manufacturers, Dongguan suffered from the effects of the 2008 Global Financial Crisis, experiencing negative growth for the first time in its thirty years of industrialization in early 2009. Responding to the downturn, the ‘Replacing Humans with Robots’ scheme is the local government’s idea to turn an industrial zone—known as the ‘workshop of the world’—into a base of ‘intelligent’ manufacturing through automation and the use of industrial robots. The immediate goal of the program is to support automation with a RMB200 million annual fund to help firms boost productivity from RMB80,000 per capita to more than RMB110,000 per capita. This effort provides an early ‘laboratory’ in which to address China’s problems of adding value and improving worker’s living standards. Dongguan experienced a boom in the electronics and information technology (IT) industries following the Asian Financial Crisis of 1997. Since then, electronics and communication equipment manufacturing has become Dongguan’s largest industry, while the IT segment (large by global standards) remains lower on the value chain, confined to manufacturing parts for PCs while needing to import other core components. Thus, Dongguan exemplifies the dilemma many emerging economies face as they struggle to modernize their manufacturing bases: how to increase productivity, and enhance the lives of factory workers? Based on participant-observation, as well as interviews with staff across eight robot-user firms and four robot-supplier firms in late 2015, it is clear that managers adopted the scheme largely to improve productivity and profits, while the workers we observed and interviewed expressed mixed feelings about the results of the process. We interviewed both workers at factories that had undertaken no automation and others in factories that had begun automating. Some of these workers had kept jobs with their firms, while others had been laid off as a direct result of automation. The local government subsidized half of the factories studied, which ranged from metals processing, furniture and electronics to automobile parts and bicycle and motorcycle helmet manufacturing. Among the manufacturers seeking to improve profits through enhanced productivity, one reported having to upgrade its manufacturing process on a regular basis, which generally involves replacing old machines with more highly automated equipment, enabling the firm to produce 2.6 million sets of optical sheets for mobile phones per month with only 120 workers. Another factory reduced its workforce from 20 to only three workers per production line, thereby replacing some 85% of its production workers with machines. In this case, the workers were lucky enough to be shifted to quality control. But many elsewhere are not as fortunate, and even then, these workers could see their quality control function automated in the near future. Another factory sought to enhance production quality, rather than just increase production quantity, purchasing over 30 CNC machines in a series of upgrades. The manufacturer noted however, that while these upgrades have enabled the firm to enhance the quality of the products it sells, only prudent planning and effective software enable the new hardware to operate efficiently. In this case, the upgrades underscored the need for skilled workers, and the firm has created a mechanism—which it calls the “apprentice track”—to train workers for its machinery. One helmet manufacturer illustrates the difficulties faced by automation. A manager at the firm—which makes bicycle and motorcycle helmets for global, Western brands—reported that, while it might cost USD25 to make a motorcycle helmet in the facility, the end user will pay as much as six times that for the finished product. Unsurprisingly, the firm is now trying to develop its own bicycle helmet brand for the Chinese market, already moving into the ODM space with a strong research and development (R&D) department. However, the problem for OBM upstarts is that global brands discourage OBM activities in their suppliers. Global brands are known not only to withhold design features from their manufacturers, but even orders from any factory seeking to develop its own brand. In response, budding manufacturers-turned-OBMs are directing their efforts at domestic markets. Still, the firm invested RMB4.5 million to upgrade, reducing their workforce from 93 to 36 workers, all while doubling productivity and reducing defects. As for the workers, the ones we interviewed acknowledged the need to shift labor from noisy, dusty, injury-risking and sometimes toxic shop floors to a cleaner environment to recruit younger workers. Automation improves occupational health and safety for many workers, for whom OEM manufacturing has brought no shortage of hardships. Still, robotization and automation can reduce wages and increase deskilling – a process that renders today’s skills obsolete. Of course, still many more workers are not lucky enough to see their jobs preserved or to be offered the opportunity to acquire new skills. As the mainstream Chinese media and many scholars tout the potential of industrial upgrading, our research sounds a cautionary note. For both businesses and workers, there are advantages and disadvantages. If China wishes to move up the global value chain and manage the rising cost of labor, policy makers need to analyze the apparent contradictions that technological development can bring. At this stage in China’s economic development, policy makers need research into how technology will affect China’s firms and its place in the global value chain. The first area researchers ought to look at is the micro-level dynamics affecting the labor market. For instance, in our case studies, some technologies require more skilled workers while others replace skilled workers, effectively deskilling the workforce. Another area to look at is any macro-level gaps along the global value chain. Such research would give insight into how Chinese firms can create value with stronger R&D and marketing expertise. This is particularly important considering the disagreement over what is best for the Chinese economy. On the one hand, economists and officials who promote industrial upgrading blame rising labor costs and labor laws that protect workers for hindering China’s efforts to become a high-value economy. While on the other, labor sociologists argue that aggressive exploitation of labor and natural resources is what is preventing China from sustaining its accustomed pace of economic growth. What is for certain though, is that before China plunges headlong into replacing people with robots, it must understand the forces which determine whether automation will drive growth and improve workers’ lives or bring dwindling profits, overcapacity, and social misery. Naubahar Sharif is an Associate Professor of Social Science at HKUST. He has published in leading journals such as Research Policy, Science and Public Policy, International Journal of Technology Management, and Science Technology and Human Values. Naubahar has consulted for the Innovation and Technology Commission and is currently Associate Editor for the Journal of Knowledge-Based Innovation in China, as well as a scientific committee member for Innovation and Development. Prof Sharif is an expert in sociology of innovation systems, the role of innovation and technology in Hong Kong, university-industry linkages and economic linkages between Hong Kong and Guangdong. Yu Huang is a postdoctoral fellow at the Division of Social Science, HKUST. Since 2015, she has worked with Prof. Sharif to explore the capital and labor problems faced by China’s robotic revolution. The research is made possible with a 2016 IEMS “Jobs and Development Research Grant.” In the past, Yu Huang has studied shrimp aquaculture in China, trying to understand how overproduction has led to a vicious cycle of value-loss and shrimp mortality. She also worked as Assistant Professor at the Anthropology Department of CUHK.